Sugaralmond plant (Pachyphytum oviferum): growing, planting, caring. Did you know? 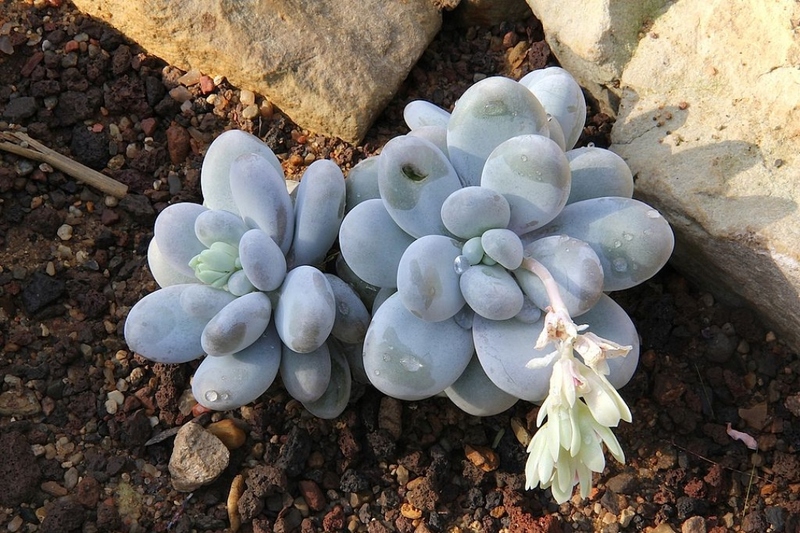 The meaning of the name Pachyphytum oviferum is 'thick plant bearing eggs'. Pachyphytum is a genus of about fifteen succulent plants native to the mountains of Mexico. P. oviferum - the sugaralmond plant or moonstone - is the most popular species of the genus. The stems (20 cm long, 1 cm thick) rise then fall with about 15 leaves, each 3 to 5 cm long and 8 to 17 mm thick, bluish, looking like a sugared almond confection. The inflorescence consists of a 30 cm stem bearing scarlet, bell-shaped flowers. Typically a warm climate plant, this plant adapts especially well to the interiors of our homes and apartments. It develops well between temperatures of 18-22°C (and cooler in winter, if possible), and it requires a lot of light! You can plant it in open soil if the temperatures in your area don't drop below 0°C - otherwise, keep it in a pot and shelter it before the frosts ! Your sugaralmond plant dislikes excessive watering, as its water needs are pretty limited — it stores everything it needs inside its thick leaves! During growth seasons (spring, summer), watering should be regular, about once or twice a month, but controlled, to make sure the roots don't rot. In autumn, gradually reduce watering until winter, when once-monthly watering will suffice - even less, depending of the humidity in the air. Never ! Your sugaralmond plant likes poor soils, really! Your sugaralmond plant multiplies very easily by cuttings: it survives in fact several days without roots! Take a twig of 7 to 10 centimeters, but sometimes a simple broken leaf can do the trick! Let it dry for a few days until a "callus" appears - it's a small bulge - at its base, normally within 4 days. Then put it in a pot on the surface of a sand substrate or mix slightly damp soil / sand. Keep it in a room at about 20-25 ° C, and in a location with lots of light, but not in direct sunlight! Water moderately, allowing the surface of the substrate to dry between 2 waterings. After a few days, an identical seedling will appear at the base of the leaf: transplant the seedlings into another pot after about 3 months. Your sugaralmond plant is not very sensitive to diseases, except when it is too watered. It can then be attacked by mealybugs or kermes, mildew or thrips. Mealybugs are sucking biting insects covered with a sort of waxy or powdery shell. If the leaves become sticky and become covered with sooty mold and the infected parts of the plant dry up, spray rapeseed oil to smother them. Thrips is a small, 1 to 2 mm pitting insect that appears in hot, dry weather, much like red spiders. A spray of water slightly soaped on the leaves at the first outbreaks may contain it. In all cases, check the frequency of your watering, and possibly the hygrometry of the room. Do not hesitate to take out your sugaralmond plant for the summer! Just avoid placing it directly in direct sunlight or in a situation with too little shelter - acclimatize it slowly, and of course, watch the watering! You should bring it inside at the end of the summer. Bring back your sugaralmond plant inside long before the first cool nights, ideally in a room not too heated so that it "feels" it is actually winter. It is also on this condition that it will produce small star-shaped flowers in early spring: a good winter period cool with 5 to 10 ° C at night without artificial light is needed! You will water once a month in winter.